In a fundamental change in scholarly publishing practice, the College Art Association has announced new standard contracts with contributors to its lead journals. These new contracts encourage scholars and artists contributing to its journals to employ fair use for third-party works in copyright (such as images and quoted text) according to the principles and limitations outlined in CAA’s Code of Best Practices in Fair Use for the Visual Arts. This is in contrast to previous contracts for the CAA journals, which (like other standard contracts in the field) required contributors to obtain permissions for most illustrations and other third-party works. By adhering to the principles of fair use in this new policy, CAA leads the way for other scholarly publications and presses to similarly embrace the doctrine of fair use. In its new author agreements, CAA states that after careful review of the Code the author must determine whether or not fair use may be invoked. If the conclusion is in the affirmative, CAA will publish without requiring third-party permission; in addition, the agreements state that the author need not indemnify CAA for claims of copyright infringement with respect to the use of a third-party work which he or she has determined is a fair use. The author’s signature on the document certifies that she or he has read the Code and considered the limitations of fair use as outlined in an addendum to the agreement. Authors will still need to obtain permission for third-party works that are not utilized under fair use. The new contracts are available in the Publications section of the CAA website. Only months after its release, major visual arts organizations continue to endorse CAA’s Code of Best Practices in Fair Use for the Visual Arts. The Society of Architectural Historians (SAH) and the Association of College and Research Libraries (ACRL) each voted in April to endorse CAA’s set of principles regarding best practices in the fair use of copyrighted materials. In June, the Art Libraries Society of North America (ARLIS/NA) and Association of Research Libraries (ARL) also voted to endorse. Founded in 1940, the Society of Architectural Historians is a nonprofit membership organization that promotes the study, interpretation and conservation of architecture, design, landscapes, and urbanism worldwide. SAH serves a network of local, national and international institutions and individuals who, by vocation or avocation, focus on the built environment and its role in shaping contemporary life. SAH promotes meaningful public engagement with the history of the built environment through advocacy efforts, print and online publications, and local, national, and international programs. The Association of College and Research Libraries (ACRL), a division of the American Library Association, is the higher education association for librarians, committed to advancing learning and transforming scholarship. Founded in 1940 and representing nearly 11,000 academic and research librarians and interested individuals, ACRL is dedicated to enhancing the ability of academic library and information professionals to serve the information needs of the higher education community and to improve learning, teaching, and research. As Mary Ellen K. Davis, executive director of ACRL, stated: “The Code will serve as a valuable open-access resource for our higher education stakeholders.” Both organizations are disseminating the Code to their members. The Association of Research Libraries (ARL) is a nonprofit organization of the leading research libraries in the US and Canada. Comprising more than 125 libraries at comprehensive, research-intensive institutions, its mission is to shape and influence forces affecting the future of research libraries in the process of scholarly communication. ARL pursues this mission by advancing the goals of its member research libraries, providing leadership in public and information policy to the scholarly and higher education communities, fostering the exchange of ideas and expertise, facilitating the emergence of new roles for research libraries, and shaping a future environment that leverages its interests with those of allied organizations. Groups that previously have endorsed the Code include the Association of Art Museum Curators (AAMC) and the American Library Association (ALA). CAA welcomes other endorsements, and encourages organizations in the field to recommend the Code to members. CAA representatives are happy to address questions and to make educational presentations. To make arrangements for a presentation, whether by webinar, conference call, or in person, please contact me at jlanday@collegeart.org. The Code and supporting materials are available at www.collegeart.org/fair-use. The creation of CAA’s Code of Best Practices in Fair Use for the Visual Arts was funded by the Andrew W. Mellon Foundation, with additional support provided by the Samuel H. Kress Foundation. Register now for the next webinar in CAA’s series on fair use in the visual arts, meeting this Friday, May 29 at 1 PM EDT and the final review on Friday, June 5 at 1 PM EDT. Join the lead principal investigators of CAA’s new Code of Best Practices in Fair Use for the Visual Arts, Patricia Aufderheide, university professor in the School of Communication at American University and Peter Jaszi, professor of law in the Program on Information Justice and Intellectual Property at American University’s Washington College of Law, for an in-depth look at the Code’s section on fair use in museums and archives and a final review of the entire series. Registration for the live events is free and open to the public thanks to a generous grant from the Andrew W. Mellon Foundation. Video recordings of the webinars in this series are available for CAA members. To access, log into your account on collegeart.org and click on the “Webinars” tab in the left-hand navigation column. Recordings of each webinar in the series will be made available to members the week following the event. CAA’s Webinar on Fair Use in Teaching and Art Practice Is This Friday, May 15! Register now for the next webinar in CAA’s series on fair use in the visual arts, meeting this Friday, May 15 at 1 PM EDT. Join the lead principal investigators of CAA’s new Code of Best Practices in Fair Use for the Visual Arts, Patricia Aufderheide, university professor in the School of Communication at American University and Peter Jaszi, professor of law in the Program on Information Justice and Intellectual Property at American University’s Washington College of Law, for an in-depth look at the Code’s sections on fair use in teaching and art practice. Registration for the live event is free and open to the public thanks to a generous grant from the Andrew W. Mellon Foundation. Video recordings of the first two webinars in this series are now available for CAA members. To access, log into your account on collegeart.org and click on the “Webinars” tab in the left-hand navigation column. Recordings of each webinar in the series will be made available to members the week following the event. The visual arts community is already putting the Code of Best Practices in Fair Use for the Visual Arts to work in Detroit. At a late-April meeting at the Cranbrook Art Museum, speakers showed fair use can enable work in five areas. Publishing. At Wayne State University Press, explained its director Jane Hoehner, fair use is essential to publishing work on film studies, one of the press’ major lines. Until now, the Society for Cinema and Media Studies code of best practices in fair use has been useful, but this new code opens more opportunities. The press does not depend on fair use for covers of the books, which function more like advertisements and are much harder to justify as a transformative use because of that. Teaching. Diana Y. Ng, who teaches art history at University of Michigan-Dearborn, was pleased to see that current practice in her department agrees generally with the field’s consensus on using teaching materials. Fairly-used materials are, among other things, limited both to a particular course and to the students, teachers and staff in that course, and images are used at an appropriate resolution for teaching. Museums. Terry Segal, a registrar for the Detroit Institute of Arts, sees fair use as a way of expanding access and also streamlining work. She took heart from the simplicity of CAA’s fair use code. As someone who has spent a lot of time granting and getting permissions, she found the fact that fair use is so simple to execute heartening. “When we’re using fair use, we don’t have to worry about what all the rights in the piece are,” she noted. Librarians, museum staff, scholars, artists, and teachers at the event seized upon copies of the Code to share with their colleagues. We look forward to stories of how the Code was received and used; stay in touch at nyoffice@colleageart.org. 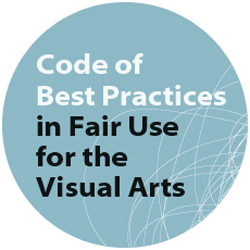 Since the Code of Best Practices in Fair Use for the Visual Arts launched in February, it has begun conversations in libraries, museums, archives, editorial offices, and classrooms. (Need a refresher on that code? Check out this video!) Now, it’s picking up fans. The Society of Architectural Historians (SAH) and the Association of College and Research Libraries (ACRL) have just endorsed the Code and other organizations have also expressed their enthusiasm. The Association of Art Museum Directors (AAMD) sent a letter of support to CAA in February, as has the American Alliance of Museums (AAM), which also posted it on their resource page. The Code’s facilitators have been busy with workshops and presentations at the San Francisco Art Institute, the Art Libraries Society of America annual conference in Dallas, a meeting of the Legal Issues in Museum Administration in Washington, D.C., the University of Chicago and Western Illinois University among others. The College Art Association has also sponsored several webinars, including a five-part series that continues into May. If you’re interested in hosting an event on fair use in the visual arts, contact nyoffice@collegeart.org. The Andrew W. Mellon Foundation has awarded a second grant of $60,000 to the College Art Association (CAA) to administer the Meiss/Mellon Author’s Book Award for one year. The award was first given to CAA in 2013 as a temporary measure to provide financial relief to early-career scholars in art history and visual studies who are responsible for paying for rights and permissions for images in their publications. The Meiss/Mellon Author’s Book Award will provide grants directly to emerging scholars to offset the costs of securing images for their first books. Recipients will be selected on the basis of the quality and financial need of their project, and awards will be made twice during the year (in the summer and fall). CAA anticipates awarding between ten and twelve Meiss/Mellon Author’s Book Awards in 2015. Scholars may submit applications for the summer round of the Meiss/Mellon Author’s Book Award before the June 12, 2015 deadline. The fall deadline is September 15, 2015. CAA will administer the Meiss/Mellon Author’s Book Award according to guidelines developed for the Millard Meiss Publication Fund grant, an award established in 1975 by a generous bequest from the late Professor Millard Meiss. The jury for the award, comprising distinguished, mid-career or senior scholars whose specializations cover a broad range of art scholarship, has discretion over the number of and size of the awards. For further information about the award and to apply, please visit www.collegeart.org/meissmellon. CAA seeks to alleviate high reproductions rights costs related to publishing in the arts. With funding from a separate, generous grant from the Andrew W. Mellon Foundation and a start-up grant from the Samuel H. Kress Foundation, CAA recently published its Code of Best Practices in Fair Use for the Visual Arts. Part of a multi-year effort led by Patricia Aufderheide and Peter Jaszi, the Code presents a set of principles addressing best practices in the fair use of copyrighted materials based on a consensus of opinion developed through discussions with visual-arts professionals. For specific questions about applying to the Meiss/Mellon Author’s Book Award, please contact Sarah Zabrodski, CAA editorial manager, at szabrodski@collegeart.org or 212-392-4424. CAA’s Webinar on Fair Use in Scholarship Is This Friday, April 10! Register now for the next webinar in CAA’s series on fair use in the visual arts meeting this Friday, April 10 at 1 PM EDT. Join the lead principal investigators of CAA’s new Code of Best Practices in Fair Use for the Visual Arts, Patricia Aufderheide, university professor in the School of Communication at American University and Peter Jaszi, professor of law in the Program on Information Justice and Intellectual Property at American University’s Washington College of Law, for an in-depth look at the Code’s section on fair use in analytic writing. Registration for the live event is free and open to the public thanks to a generous grant from the Andrew W. Mellon Foundation. A video recording of the first webinar held on March 27th, “An Introduction to CAA’s Code of Best Practices in Fair Use for the Visual Arts,” is now available for CAA members. To access, log into your CAA account and click on the “Webinars” link in the left-hand navigation. Recordings of each webinar in the series will be made available to members the week following the event. You may register for the first webinar (March 27) here. Registration for the remaining four webinars is available as a series here. Regardless of the number of these sessions you wish to attend, please register for the entire series and participate in whichever sessions you would like. Registration is free and open to the public thanks to a generous grant from the Andrew W. Mellon Foundation. The webinars will be available at a later date as archived videos for CAA members. Questions? Email CAA at nyoffice@collegeart.org.